Garlock Flexseal Spiral Wound Gaskets Provide A Versatile Sealing Solution That Does Conditionally Handle Many Harsh Industrial Environments. They Have A Proven Record For Solving Sealing Problems That Are Incurred Using High Temperature Manufacturing Processes That Rely On Thermal Cycling. The Inside Sealing Element Is Manufactured Using High Quality 304 Stainless Steel "V" Shaped Winding That Is Layered With High Temperature Resistant Flexible Graphite. The Open "V" Of The Sealing Element Is .175 Thick Pre-Installation And Is Surrounded By A High Strength Carbon Steel Outer Retaining Ring. 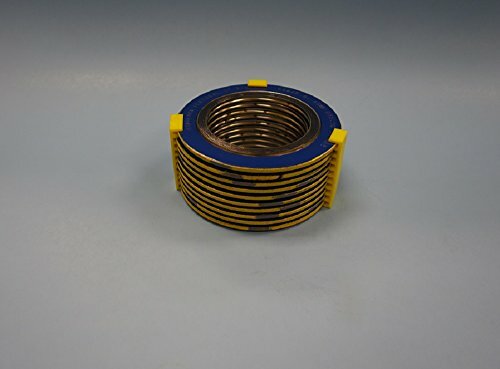 The Retaining Ring Is .125 (1/8) Thick, And Acts As A Limitation That Reduces The Chance Of Over Torque During Installation While Giving Protection From Dangerous Gasket Blow Out When Installed Properly In the Correct Environment. The Outer Dimensions Of The Retaining Ring Are Designed To Ride Inside The Bolting Ring For Easy Drop In Installation Between Flanges. Good For Thermal Cycling High Temperature Applications. The Outer Dimensions Of The Retaining Ring Are Designed To Ride Inside The Bolting Ring For Easy Drop In Installation Between Flanges. Meets AMSE B16.20 Specifications For AMSE B16.5 Flanges. With Flexible Graphite Filler Sealing Element.